A rogue’s gallery of the world’s despots and war criminals descended on London last week, at the invitation of the British government. They were attending the Defence and Security Equipment International Exhibition (DSEI). 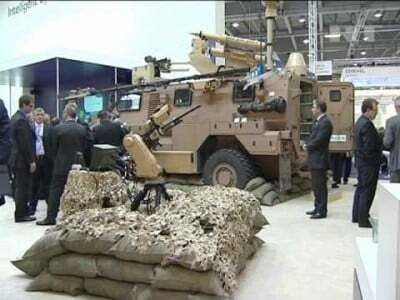 The biannual arms fair, held over four days at the ExCeL Exhibition centre in London’s Docklands, showcases cutting-edge weapons technology as well as military hardware aimed at suppressing working class rebellion. More than 1,000 arms manufacturers flaunt their wares, including Lockheed Martin, Boeing, Raytheon and Bae Systems, and Israel’s Elbit systems. Financed by the taxpayer, via the UK Trade & Investment’s Defence & Security Organisation (UKTI DSO), a government department, this year’s event was the biggest ever. Over 30,000 people are estimated to have attended from 61 countries, including 2,800 VIPs ranging from senior generals to defence ministers. The primary objective of UKTI DSO is to work on behalf of private manufacturers to promote the sale of weapons to other countries. In 2014, the UK secured export deals for weaponry worth £8.5 billion and security equipment worth £3.4 billion. The UK’s is now the world’s second largest exporter of defence equipment, behind the United States. Despots, murderers and human rights violators from Saudi Arabia, Israel, Ukraine, Egypt, Bahrain, the United Arab Emirates, Angola, Azerbaijan, Iraq, Pakistan and Kazakhstan, were invited to the DSEI in an official capacity, and accommodated throughout. Given the nature of the regimes attending, it is hardly surprising that investigations of past DSEI arms fairs uncovered the illegal trade of torture implements such as electric shock stun guns and batons, leg irons, and belly, body and gang chains. All of these are illegal under British law. One may be forgiven for thinking that those peddling such torture devices had somehow slipped through the net of a rigorous checks procedure. Yet it was found that implements for the use of torture were on sale at DSEI in 2005, 2007, 2011 and 2013. In 2005, cluster bombs were being promoted and offered for sale, despite reassurances by organisers that such weapons would not be traded. Cluster munitions are designed to release hundreds of explosive bomblets or landmines onto their targets. In 2011, two unnamed arms companies were found to be promoting the sale of cluster munitions at DSEI. This was in clear violation of the 2010 Oslo Convention on Cluster Munitions, which legally prohibits their use and stockpiling. UK Foreign Office minister Tobias Elwood argued earlier this year that the UK “operates one of the most rigorous and transparent arms export control regimes in the world.” Clearly none of this prevents it from supplying deadly weaponry to filthy blood-soaked regimes. Israel’s brutal invasion and bombing of the Gaza Strip in July 2014 led to the death of over 2,200 Palestinians, with a further estimated 11,000 wounded. During the 50-day onslaught, some 20,000 homes were destroyed with up to 500,000 Palestinians displaced. Most of those killed were civilians, including 490 children. The British government granted 68 arms export licences to Israel worth £7 million between January and June of 2014. A further £4 million was approved after Israel had concluded its slaughter of thousands of Palestinians. Since 2010, Britain has authorised arms licences to 19 countries blacklisted by the United Nations for grave violations against children, including the use of children as soldiers. Total arms sales to such counties stands at £735 million. Of the 23 countries blacklisted by the UN for appalling human rights abuses, including the use of children as soldiers, Britain has permitted arms sales to all but four of them. The recruitment of children into armed groups within the Democratic Republic of Congo has been well documented. Yet the country has received £2.4 million worth of military hardware from the UK since 2010. Despite United Nations (UN) proof that the Somali National Army, as well as al-Shabaab, have engaged in the recruitment of children as soldiers, Somalia has likewise received some £6.7 million in arms from the UK, including assault rifles, ammunition and vehicles. Saudi Arabia received £1.6 billion in approved weapons exports in 2014, including “components for military equipment for initiating explosives”, “equipment for the production of machine guns”, “CS hand grenades”, “components for water cannons” and “tear gas/ irritant ammunition”. With an increase of 54 percent in the last year, Saudi Arabia has become the world’s biggest importer of weapons. Figures released by Amnesty International last month showed that 175 people had been publicly beheaded already this year in Saudi Arabia. Those executed included people with mental disabilities as well as children under 18. During the first month of the bombing campaign, Saudi Arabia conducted 2,200 missions in Yemen. Since then hospitals, schools, factories and refugee camps have been bombed and shelled. At least 5,000 people have been killed. According to UN figures, a staggering 80 percent of Yemen’s 25 million population are now said to be on the brink of famine. As a result of British arms sales, Saudi Arabia possesses twice the amount of British-made warplanes than those of the Royal Air Force, all of which are now being used to perpetrate war crimes against civilians. Just this summer, Britain delivered to Saudi Arabia a consignment of 500lb Paveway IV bombs originally earmarked for the RAF. War crimes such as the indiscriminate targeting of populated areas by Saudi Arabia are now routine, leading the president of the International Committee of the Red Cross (ICRC), Peter Maurer, to publicly declare, “The humanitarian situation is nothing short of catastrophic.” In the days ahead, it is expected that Saudi Arabia will purchase additional weapons from Britain to continue its campaign of horror and bloodshed. But behind the fine words, there is the brutal reality. Azerbaijan and Egypt were not invited to the DSEI’s 2013 event. Significantly, both were welcomed to this year’s gathering. In July 2013, Egyptian dictator General Abdel Fattah al-Sisi took power in a bloody Western-backed military coup, overthrowing the government of Muslim Brotherhood President Mohamed Mursi. Since then the al-Sisi regime has killed at least 3,000 people, including the massacre of over 1,000 members of the Muslim Brotherhood. In 2014, Egypt’s courts condemned a total of 1,397 political detainees to death in three mass show trials. In January this year, al-Sisi boasted that his regime had imprisoned nearly 10,000 people in the previous year.